Job Fair at EBP on May 3rd - connecting local businesses in Rochester with great talent! Recruiting on the Road comes to The Park. Monroe County and RochesterWorks! 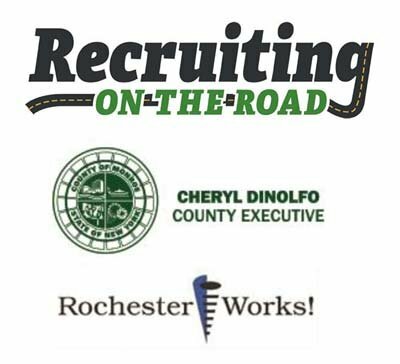 Monroe County’s largest employment and training initiative, is proud to announce an expansion of our successful Recruiting Round Rochester weekly mini-job fair. For the better part of a decade, RochesterWorks! has welcomed hundreds of local businesses into our North Goodman Street location on Monday mornings to network and interview thousands of jobseekers. On May 3, 2017, we will partner to bring Recruiting on the Road into the community. Our first event was help on March 8th at the Penfield Public Library; We hosted 7 businesses and about 100 job seekers. May 3rd is sure to bring more success. Recruiting on the Road is free and open to the public. Job seekers will meet with local companies who are actively recruiting for a variety of positions and industries. Job seekers are encouraged to dress for an interview and bring extra copies of their resume. Additional information including the list of businesses participating and their open positions will be available at www.rochesterworks.org. We would love to have you be a participating business. If you would like to register, please contact Karyn Benetti.